The 3rd running of this bi-annual historic racing event. 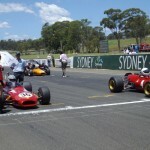 In early 2005, the Historic Sports and Racing Car Association saw the need for a high profile Historic Racing meeting that the State of New South Wales could proudly call its own. Historic racing has come of age. 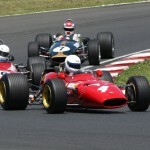 No longer are the cars from a distant past as recent grids encompass cars of the Formula 1 (and Indy) turbo era, cars that were seen on television not long ago and that are now in the hands of motorsport enthusiasts from around the world. Added to these are the thunderous Formula 5000s, exotic sports-cars and everyone’s favourite the touring cars. In fact historic racing now encompasses cars from as recent as 1989. Many are far quicker, noisier and more exiting to watch than the premier modern Formulae that are racing here in Australia. To demonstrate the calibre of the sport today, the historic racing current lap record is held by Guido Belgiorno-Nettis in a 1985 ex Alboreto Ferrari 156 at a time of 1:26.41 – that’s a full 5 seconds quicker than the V8 Supercar record of Mark Skaife. A recent acquisition by another Club member, Aaron Lewis, of a 1972 March M16B that lapped Indianapolis at 192.885 mph to be on the front row of the grid that year, might yet give that a shake. At the V8 Supercar round at Sydney Olympic Park in December 2009, the HSRCA mounted a display of around 35 cars including a tribute to triple Formula 1 Champion, Sir Jack Brabham. Of the thousands that inspected the cars, many did not realize that such modern and super fast cars were now a part of the historic racing scene, a scene that in the UK, Europe and the USA attracts spectators in vast numbers, often more than 100,000. The 2006 inaugural event brought in about 30 cars from around the world to supplement the wonderful array of cars that are part of the Australian scene. With rave reviews from magazines around the world, planning for the 2nd event started straight away. The 2008 event brought even more cars from overseas, this time around 50, and included a number from Japan. 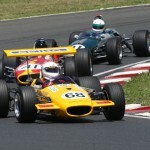 For the first time in a very long time a grid of 20 Formula 5000s was seen racing, including many from across the Tasman. It is from the 1960s Tasman era too that some of the real star cars came. 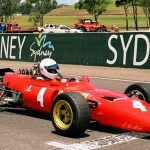 Amongst them was the Ferrari Dino 246T, the actual car used by New Zealander, Chris Amon in 1968 to be runner up behind Jim Clark. 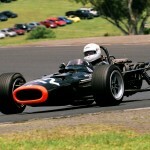 From the same owner, came the BRM P126 V12 used also in the 1968 Tasman Championship in NZ by Bruce McLaren and in Australia by Richard Attwood. Early indications are that the Ferrari will definitely be back to defend its win in 2008 and that the BRM will probably join it. These cars were by no means the only stars in the Tasman Revival race itself. There were many notable Brabhams, including Sir Jack’s Formula 1 BT24 from 1967 that came 2nd in the F1 Championship that year, a brace of wonderful Lotuses and McLarens, Coopers and local Elfins and Rennmaxes. The value of the cars in the Repco Tasman Cup race of 2008 would have been well over $15 million. 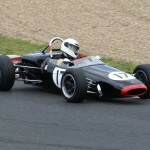 As mentioned above, the Formula 5000 brigade turned up in force and there is nothing else in the world to make the ground shake under your feet more than 20 or so 650bhp monsters unleashed at once. The 5000s were a part of the Tasman scene from 1970 onwards when the 2.5 litre era ended and as they continued the Tasman Series, so they continue the Revival. Whenever and wherever they run, they attract a huge following. Many of these cars are domiciled in New Zealand, and early indications are that they will once again grace Eastern Creek to create a noise and spectacle the likes of which modern motorsport can only dream about. Of course historic racing isn’t just about star cars – it is about enthusiasts learning about and racing their cars. 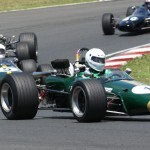 Included in the programme will be Formula Juniors and Formula 3 cars which always stage hotly contested races, as well as the cars with wonderful heritage from the earlier eras of the 30’s through to the 70s. Historic racing today also caters for the ever popular Touring cars and Sports cars and there will be many of the best in Australia at this meeting. Cars like the incredible Geoghegan Mustang, the car that won more touring car rounds than any other. As with any high profile event, the 2010 Tasman Revival will attract the very best Australia has to offer and negotiations are already under way for an even larger contingent from around the world. This is after all, a recreation of what happened in the 1960s when the Northern hemisphere shut down for the winter and the factory teams headed “downunder” for some fun in the sun. The owners of these cars see it no differently today and that is why on a bi-annual basis we are privileged to see them return. Overseas, many of the top cars are driven by well known drivers so watch this space for future announcements in this regard. Finally one of the most appealing aspects of the Tasman Revival is that the admission ticket allows free entry into the paddock area. Here you can enhance the spectacle of wonderful cars with the smells of hot oil, hot coolant and hot brakes with the owners and drivers, all of whom would just love to talk about their cars with you.